We have successfully closed iPOP this year. Let me thank you all for your kind support and donation for children on behalf of the committee. At the conference, we mentioned that more than 200 children, expected to success in the future, has given up hope to continue their education due to the earthquake disaster two years ago, and asked for donations in participation fee for the reception. Fortunately, we were able to donate 65,000 yen to the Japanese nonprofit organization Ashinaga (“long-legs”). Aug. 30, 2013 Thank you message in this page is uploaded. June. 24, 2013 iPOP Photos are uploaded. June. 21, 2013 Online Proceedings page is updated. June. 4, 2013 Online Proceedings page is updated. May. 31, 2013 Online Proceedings page is updated. May. 30, 2013 Online Proceedings page is updated. May. 29, 2013 Online Proceedings page is updated. May. 22, 2013 Online Proceedings page is uploaded. May. 9, 2013 Program is updated. May. 7, 2013 Booth Layout is updated. April. 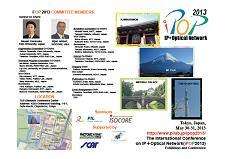 26, 2013 Program is uploaded. April. 25, 2013 Registration is started. April. 18, 2013 Program at a Glance is uploaded. April. 16, 2013 Call For Participation is updated. April. 15, 2013 Participants page is uploaded. April. 11, 2013 Top page is updated. Mar. 29, 2013 Top page is updated. Mar. 6, 2013 Call For Participation is uploaded. Mar. 4, 2013 Call For Exhibition page is uploaded. Feb. 14, 2013 Submission deadline of one-page abstract is extended. Jan. 23, 2013 Committee is uploaded. Coming to TKP Otemachi Conference Center is updated. Jan. 22, 2013 Call for Presentation is uploaded. 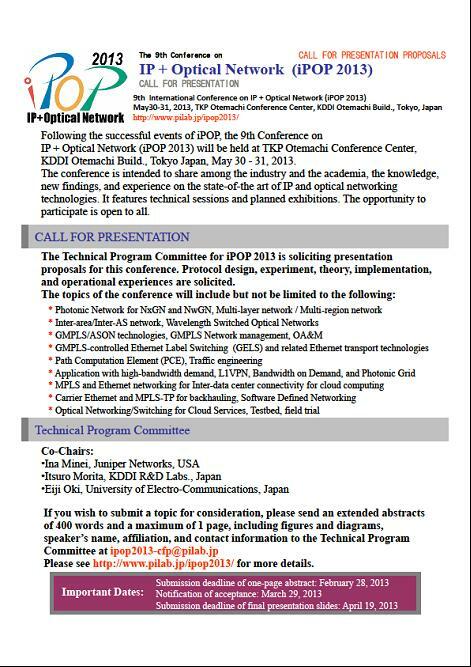 Jan. 17, 2013 iPOP2013 web site is open !